* Abdulrahman Bashir, the top striker at ABS FC, is struggling in front of goal. After Week 20 of the league, Bashir has only scored two goals. As far as I know, Bashir has featured in all 20 matches, or close to 20 matches. However, it is way to early to write Bashir off. Last season, Bashir had scored only five goals after Week 20 but still managed a total of 15 goals. * Ubong Ekpai of Akwa United FC is one of the most interesting prospects in the GLO Premier League and foreign clubs are already monitoring the talented winger / striker. Ekpai has scored six goals so far this season, some of them candidates for “Goal of the season”. At Akwa United FC, Ekpai is sharing the scoring responsibilities with striker / attacking midfielder Mfon Udoh, who has scored five goals. * Despite being a regular member of the Nigeria U-20 national football team, talented goalkeeper Gideon Gambo (born 15.11.1992) never really got a chance at Sharks FC, primarily because of the good form of Okiemute Odah, the current first-choice goalkeeper at Warri Wolves FC. 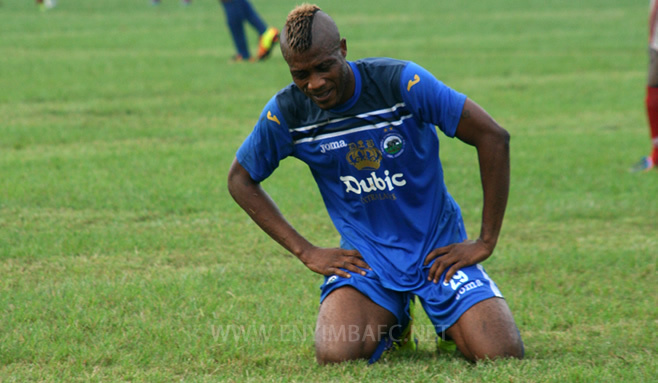 Before the current season, Gambo joined newly promoted Bayelsa United FC, where he has made some solid performances. Gambo faces tough competition from the more experienced Emmanuel Fabiyi (born 09.10.1985), a full international player for Benin. * Peter Ebimobowei (born 11.11.1993), the talented striker of Bayelsa United FC, has scored seven goals after Week 20 of the season. Fans of Norwegian football will probably remember Ebimobowei due to his trial period at SK Brann in January 2012. Norwegian media described Ebimobowei as “strong, fast and skilful”. * I’m convinced that Chigozie Ihunda, the young attacking midfielder / winger at Dolphins FC, is a player to watch. When I read match reports involving Dolphins FC, Ihunda often stands out. As far as I know, Ihunda has played 13 matches and scored one goal during the GLO Premier League 2013. * Fred Okwara (born 19.03.1989) is the top scorer at Dolphins FC with six goals. As far as I know, Okwara has played 17 matches. Okwara played for Adanaspor during the “TFF First League” 2010-2011 and 2011-2012, the second level of Turkish football. Before his European adventure, Okwara played for Rangers International FC. * Cameroonian striker Junior Rafael Boumsong has been in great form since joining El-Kanemi Warriors FC from Gazelle FC(Chad). After Week 19, Boumsong had scored four goals for his new club. Boumsong made his debut for El-Kanemi Warriors FC in May 2013, so he has played a maximum of 10 matches, making his goal-rate quite decent. * As far as I know, Fidelis Saviour (born 18.04.1988) scored 10 goals (four goals for Ranchers Bees FC and six goals for FC Taraba) during the Nigeria National League 2012, the second level of Nigerian football. Saviour is currently playing for Enyimba FC and made his debut for “Peoples’ Elephant” on 12.06.2013 against Sharks FC. Yesterday, Saviour scored his first goal for his new club, becoming match-winner against Heartland FC. Perhaps Enyimba FC has finally found a goalscoring striker? The picture is of Saviour and was found on www.enyimbafc.net. * Centre-back Peter Jang of Gombe United FC has gotten some rave reviews this season. Jang, formerly of Lobi Stars FC, is one of several young, interesting players at the “Desert Scorpions”. Others include midfielders Ibrahim Chilli and Ifeanyi Ezeugwu, goalkeeper Umar Maijalingo and striker Cyril Obodo. * Attacking midfielder Ebere Odiche, signed from amateur club Pakat FC, and striker Collins Tochukwu Esom, formerly of Plateau United FC and Rangers International FC, are two players to watch at Heartland FC. Both players have scored two goals so far this season. * Cameroonian striker Franck Banini, who failed to break through at Enyimba FC, has recently joined Kaduna United FC. * Big, powerful striker Kabiru Umar of Kano Pillars FC has scored five goals during the last eight matches of the season. Last season, Umar scored nine goals for Heartland FC. * Kwara United FC has signed goalkeeper John Lawrence from Lobi Stars FC. At Lobi Stars FC, Lawrence had lost his place to the talented Terkaa Melai (born 22.10.1991), one of the most promising goalkeepers in Nigeria. * Midfielders Oseni Jimoh and Dare Ojo are impressing at Kwara United FC. The hard-working Ojo, formerly of Rising Stars FC, has scored four goals from his midfield role and I predict Ojo will become “Player of the season” at the “Afonja Warriors”. * Lobi Stars FC has signed Lekan Agunloye from second level side Crown FC. Agunloye, formerly of Shooting Stars FC and Kwara United FC, has scored five goals during the Nigeria National League 2012-2013. * Victor Namo (born 03.11.1988), formerly of Kano Pillars FC, has scored seven goals for the newly promoted Nasarawa United FC, including at least three penalty goals. * At the time of writing, it is somewhat unclear to me if Nembe City FC has been able to hold on to their star striker Musanpa Okiki. Apparently, Kano Pillars FC is monitoring the sharp-shooting Okiki, who has scored five goals so far this season. * Chibuzor Madu is one of the unsung heroes at Rangers International FC. Madu has been a consistent performer at centre-back and deserves attention. * Moses Awala of Sharks FC could very well become one of the revelations of the season. The youngster, who was discovered at the Governor Amaechi street soccer championship in 2012, is a strong central defender or defensive midfielder. Awala has played 17 matches so far this season. * I’m still waiting for playmaker Philip Asuquo of Shooting Stars FC to find his form. After Week 20 of the season, Asuquo had looked rather average, warming the bench in several matches, despite having a potential few other players in the GLO Premier League can match. In February 2013, Asuquo was a trialist at Norwegian top level side Tromsø IL. * Oge Ogagotewho (born 13.01.1990) is an interesting newcomer at Sunshine Stars FC. Yesterday, the centre-back, formerly of Bridge Boys FC, scored his first goal for his new club. * Watch out for midfielder Freedom Omofoman at Warri Wolves FC. During the recent months, Omofoman has forced his way into the first team of the Wolves. Back in 2010, Omofoman was part of the Nigeria U-17 national football team, suggesting that he is still a teenager. * Ibrahim Shuaibu has been impressive for Wikki Tourists FC this season, having three goals to his name. As far as I know, this is the same “Ibrahim Shuaibu” that starred for second level side Giwa FC during the Nigeria National League 2012. Before the season, several Nigerian newspapers reported that Shuaibu had signed for Kano Pillars FC.